Make yourself at home in one of the 69 guestrooms. Bathrooms have bathtubs or showers and complimentary toiletries. Conveniences include coffee/tea makers, and housekeeping is provided daily. This hotel is quietly situated close to the small town of Gairloch on the northwest coast of Scotland. Through its secluded location amidst one of the least accessible and unspoilt wilderness areas of Europe, the hotel is the ideal destination for those seeking peace and quiet. Inverness Airport is some 90 km from the hotel. Affording a friendly and informal atmosphere, the hotel comprises 2 floors with a total of 17 rooms. As well as an inviting lobby with a hotel safe, the hotel also offers its guests a cosy bar, a pleasant café and an appealing restaurant (with highchairs for children). Business guests are offered use of a conference room, the public Internet terminal as well as room and laundry services. There is also a car park for all those arriving by car. The rooms have an en suite bathroom with shower, bath and hairdryer. Further facilities include a direct dial telephone, a radio and a TV as well as ironing facilities. Individually controlled heating also features within the rooms. The hotel provides an excellent base for hiking tours and bird watching in the surrounding area. The nearby Loch Gairloch offers ample space for anglers alongside the bathers. Golf can be played on the course that lies some 6 km away. Guests may select their breakfast from a buffet. Dinner may be taken either à la carte or as a set menu. In addition, the hotel caters for guests with special dietary requirements. Half-board stays may also be booked. Wonderful setting close to Gairloch harbour, nestling at the foot of Flowerdale Glen and just over an hours drive from Inverness and Ullapool. Renowned local seafood and game with local beers and a fine selection of malt whisky. Lots to do and worth at least a 2-night stay - superb walking, Inverewe Gardens, Beinn Eighe Nature Reserve, Whale Watching, Golf, day trips to islands. Award winning Inn: AA Seafood Pub of the Year 2006. 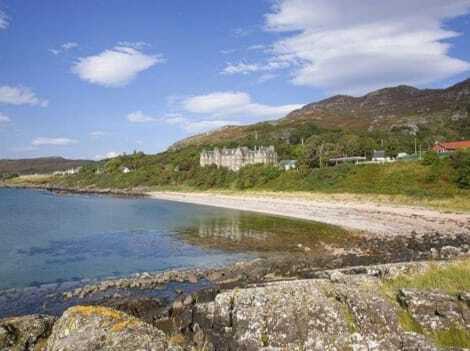 On the shores of Loch Gairloch, in the north west Highlands of Scotland, Gairloch is a beautiful village, deservedly popular with holidaymakers yet wholly unspoiled. Book one of our Gairloch hotels and explore the spectacular countryside around the village, which offers endless opportunities for walking and exploring, from serious mountain treks to gentle coastal strolls. Look out for whales, dolphins, basking sharks, otters, seals, sea eagles, porpoises and hundreds of seabirds. White-sanded and with sparkling blue water, the secluded beach at Gairloch is surrounded by mountains and moorland and is quite beautiful. The beach is safe and good for families, and has excellent views of the nearby islands. There's also the Big Sand beach, just north of the town, which is sheltered from the wind by dunes and Longa Island. Whale-watching, sea-fishing and glass-bottomed boat trips are run from Gairloch harbour, and you can hire kayaks from the Sands Caravan and Camping site. Despite its tiny size – the population of the whole parish is less than 1,000 people – Gairloch is packed with things to do. Gairloch Leisure Centre has a sports hall with four courts, a climbing wall, a fitness room, an all-weather pitch, outdoor tennis courts and a soft play area. There's a swimming pool in nearby Poolewe. Gairloch Golf Club's nine-hole course looks down onto the beach, so you'll enjoy beautiful views while you're playing. At Gairloch Heritage Museum, you can learn all about the history of the village. There are ancient tools and fishing boats on display, equipment from the nearby Rudha Reidh Lighthouse, and a Pictish stone thought to have been carved between 500 and 700AD. You can also see what life was like in the croft house, the school and the village shop. There's a local produce market in the village every Thursday from April to October, with freshly baked bread, smoked fish, homemade cakes, handmade truffles, SEOSITE_LEVEL_DESCRIPTIONt and much more on sale. Created in 1862, this world-famous sub-tropical garden at the edge of Loch Ewe, a short drive from the village, is full of colourful plants and trees from around the world. Here you'll find rare Wollemi pines – the most northerly in existence – Himalayan blue poppies, Tasmanian eucalypts and rhododendrons from China and the Indian subcontinent. The warm currents of the Gulf Stream and the 100-acre woodland planted to shelter the garden by its creator Osgood Mackenzie mean the plants can grow here despite the cold. For fresh seafood, Highland game, home-baked bread and live folk music, head to the award-winning Old Inn, a traditional coaching inn next to the harbour. The inn has its own microbrewery and serves Scottish and English real ales as well as its own home brews. Lunches, homemade scones, cakes and coffee are served at the friendly Gairloch Pantry, and you can admire the artwork on the walls. The menu at The Sheiling features a good range of classic dishes, including Scottish seafood and steak, and an impressive selection of desserts. Come here for lunch, afternoon tea or dinner and enjoy panoramic views of the loch.